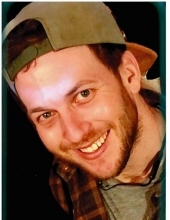 Travis M. Mann, 29, of Sinking Spring, passed away Sunday, April 8th, at his residence. Travis was born in Reading, on July 4, 1989, a son of the Donna (Fies) and Michael W. Mann. He graduated from Muhlenberg High School in 2007 and Penn College. He worked as a roofer, for Jack Mann Roofing, Reading. Travis loved his family, his dogs Kika and Grux; cats Blaze and Zoey and his bird JD. a sister, Ashley, wife of Matt Bracci and his niece Ella Rae Bracci. He is also survived by Paternal grandparents Jack and Erika Mann; Maternal grandfather Dennis and Carolyn Fies; Ronald Johnston widower of maternal grandmother Joyce Johnston. 2 Aunts Brenda Beissel widow of Robert Beissel, Debbie wife of Robert Henretty; Uncle David, husband of Anke Mann; 5 cousins Nikki, wife of Ognjen Ilice, Leah, wife of Brandon Bender, Paulina Mann, Alexandra Mann and Emily Mann; second cousins, Kaylee and Logan Bender, and Milena Ognjen. A Memorial Service will be held at 1:00 PM on Monday, April 15th at the Sanders Funeral Home & Cremation Services Inc., 1501 North 11th Street, Reading. The family will receive friends from 11:00 AM to 1:00 PM on Monday, at the funeral home. In lieu of flowers, memorial contributions may be made to LoveYourBrain Foundation, PO Box 247, Norwich, VT 05055 or www.loveyourbrain.com/donate. To send flowers or a remembrance gift to the family of Travis Michael Mann, please visit our Tribute Store. "Email Address" would like to share the life celebration of Travis Michael Mann. Click on the "link" to go to share a favorite memory or leave a condolence message for the family.